The Human Space Flight Centre (HSFC) which would be the core of the Indian Space Research Organization's (ISRO's) future manned missions was inaugurated at the ISRO headquarters in Bengaluru. 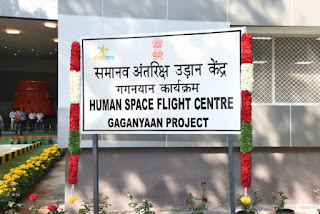 The Human Space Flight Centre will implement the first development flight of Gaganyaan with the support of existing ISRO Centres. The Human Space Flight Centre would be responsible for end-to-end mission planning, development of engineering systems for crew survival in space, crew selection and training and also pursue activities for sustained human space flight missions. Gaganyaan which is India's first manned space mission has been accorded highest priority by ISRO and the plan is to have the first unmanned mission in December 2020 and second for July 2021. The manned mission will happen in December 2021. The Gaganyaan project is headed by R. Hutton, who was the Polar Satellite Launch Vehicle (PSLV) Director. The Gaganyaan project would take the Indian astronauts into space to a height of 350-400 km above the Earth and orbits around the planet for at least a week. The Indian astronauts would be conducting experiments in the space. Q. Which centre which would be the core of the Indian Space Research Organization's (ISRO's) future manned missions was inaugurated at the ISRO headquarters in Bengaluru?